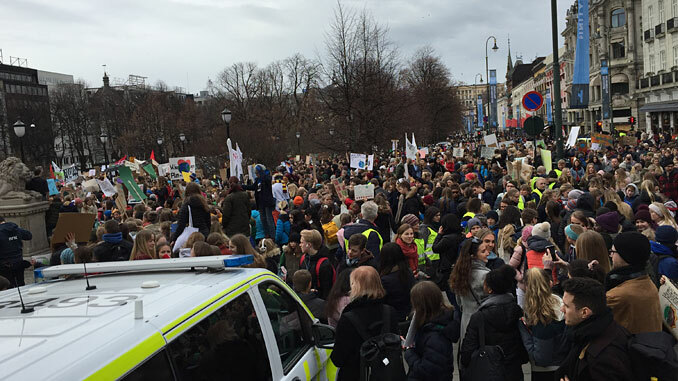 Norwegian students in the Oslo area today added their numbers to the Global Climate Strike – the youth-led protest that has seen students in major cities around the globe take to the streets earlier this month. Skolestreik for klima – School strike for the climate – was arranged by – Natur og Ungdom (Nature and Youth), a country-wide student group occupied with nature and environmental issues. By some estimates, as many as 20,000 students – of all ages – descended on Norway’s capital, the majority focusing on Eidsvoll place at the front of the Norwegian Parliament. As with their counterparts across the globe Norway’s students were demanding more government action to fight climate change.